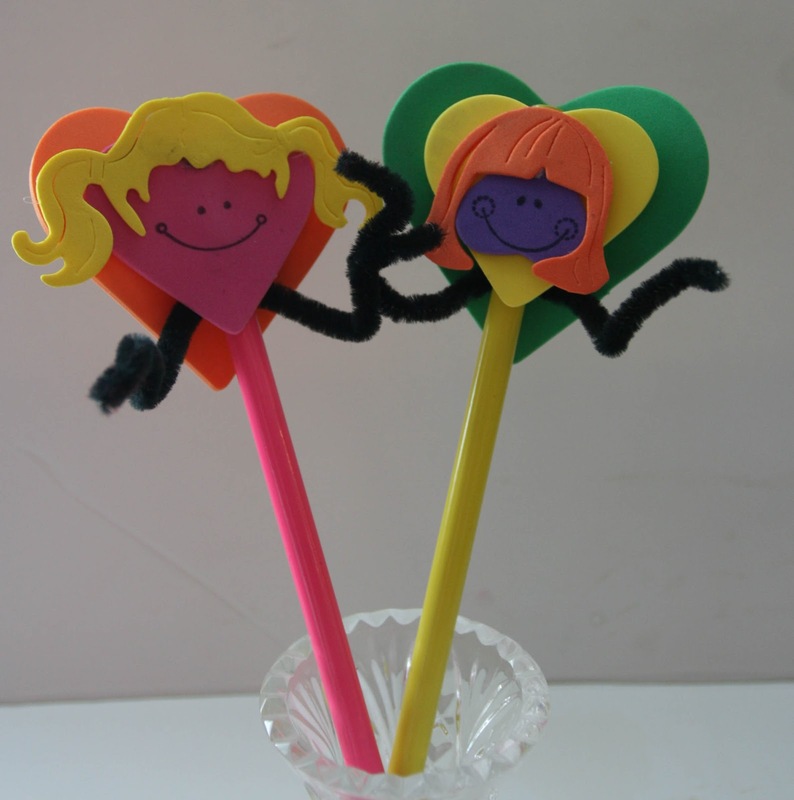 For my step-daughter's Valentines Day class party last year, I designed these cute little "Pencil Buddies" for the kids to make. I had a huge bag of pre-cut fun foam hearts in a variety of sizes that I wanted to put to use. I also have a Sizzix die that is for paper dolls and has different hairstyles on it. One more thing that made it easy is that I have a set of face stamps to use on the paper dolls. I didn't keep any of them, but for the boys, I just cut off the longer pieces of hair. 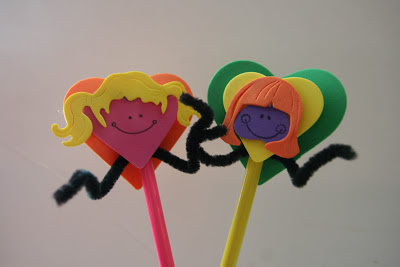 I let the kids pick their own colors and sizes of hearts to use, as well as their hair style. Some of the hair styles worked best with the heart turned upside down (purple face) vs having the point at the chin. 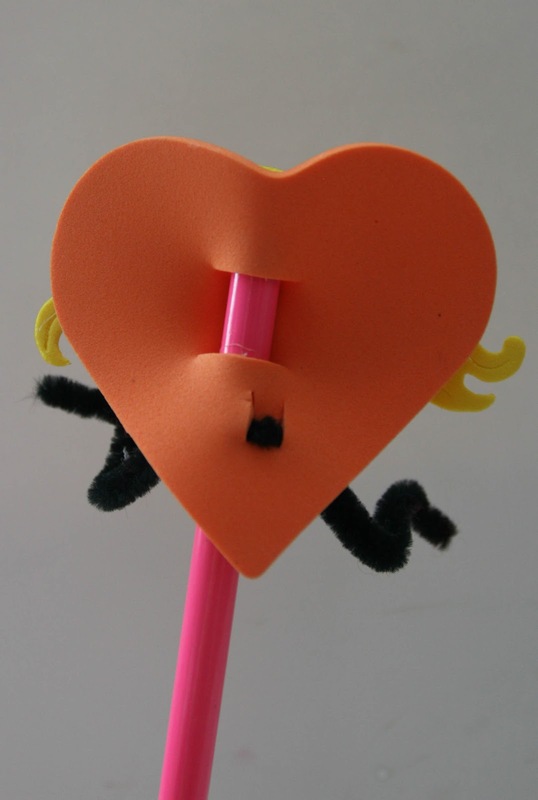 You can see on the back of the hearts where I cut the holes to insert the pencils and the pipe cleaner arms. This was a cute and easy craft for the kids. It could be re-created even if you don't have a sizzix. I used low temp glue guns for the kids so that they could put them together themselves without getting burned. This was a 4th grade class, but lower grades would probably be best with assistance from the room moms. 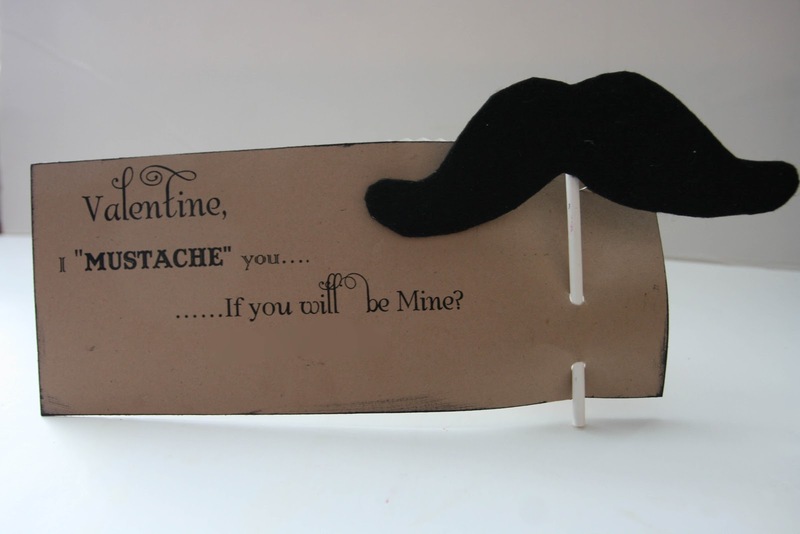 For her Valentines Day card for her classmates last year, I made these "Mustache" cards. I cut the mustaches from stiff felt, and glued them to a sucker stick. She said that everyone loved playing around with their fake mustaches that day! This year she is still into mustaches, and we have made her box for the classroom using, you guessed it, mustaches. I will post photos of that soon. Her class card this year is pretty low-key, and her dad helped her put them together. I did the shopping, but he did the assembly. I can't bring myself to send my kids out the door with those cheesy store bought cards. I sure wish I had taken pictures of all the creations I made with my kids years ago. My oldest is in college, so it had been awhile since I'd done anything like that until I got re-married last year!